Starting in 1977, the first large scale replacement of electro-mechanical switching equipment began. Before this, there were very few replacements of one type of switching equipment with another. The notable exception was the replacement of the Panel machines, which were over 30 years old at the time of replacement. Step-by-Step was rarely replaced. The Conyers Step-by-Step CDO was replaced in 1964 with No. 5 Crossbar for some reason and the Norcross Step-by-Step CDO was destroyed by fire and had to be replaced. But otherwise, the Bell System considered the old technology to be perfectly good and couldn't justify replacing it. This all changed at the end of the 1970s. There must have been something to persuade them to start the wholesale campaign of equipment changes. This was too early to have been part of the breakup of AT&T. So there must have been other factors involved. It is understandable that the era of Step-by-Step needed to end. It was very primitive, compared to more modern technology and was expensive to maintain. Crossbar was much more modern and flexible but couldn't compete very well with electronic switching, in terms of features and flexibility. Some Bell Telephone companies upgraded crossbar systems by adding computer controls to them. Southern Bell chose not to go that route and decided to replace the crossbar equipment entirely. The first big conversion in 1977 occurred when the Auburn Avenue and West-End Step-by-Step offices were retired. The customers of the Auburn Avenue buildig were moved to ESS machines in the Courtland Street building. On the same day that Auburn Avenue was closed, the West-End Step office was replaced by a new ESS machine in the same building. In February of 1980, in the Sandy Springs office, the crossbar equipment was replaced by ESS. The following month, the Columbia Drive crossbar and Toco Hills step-by-step offices were converted. Later the same year, East Lake, Hollywood Drive, East Point, Chamblee, Dunwoody, Marietta, Smyrna, and Woodstock offices were converted. In 1981, more offices were converted, starting in January with the Woodland office. In September, all of the customer served out of the crossbar offices in the 51 Ivy building were moved to ESS equipment in the Courtland Street building. The 51 Ivy building then ceased to be a local central office building and handled long distance traffic only. The same year, the Austell office was also converted. In 1982, the Adamsville Crossbar office and the Lakewood Step-by-Step office were converted. Lakewood was the last of the large Step-by-Step offices in the metro area. The Ben Hill and Forest Park crossbar offices and a few of the outer metro offices took a bit longer. It may be that Southern Bell decided to wait until the first digital switching systems became available. In the mid 1980s, Southern Bell started using Subscriber Line Carrier (SLC) facilities. This saved cable pairs going from the central office to the customer's location by multiplexing 24 lines onto a "T1" circuit, using 2 pairs of wires. This was packaged into a unit that had 4 T1 circuits in one roadside cabinet, providing 96 lines over 8 pairs of wires. The setup was called SLC96, which was pronounced "Slick 96". If you were located a few miles from your serving central office, you might have been connected to one. These started to appear all over the city. The problem with having your line served by a “slick” was that there was no backup power beyond about 8 hours. If a commercial power failure in your area occurred, the SLC would continue to operate on batteries for about 8 hours and would then quit working. The central office itself had backup diesel generators but the SLC did not. 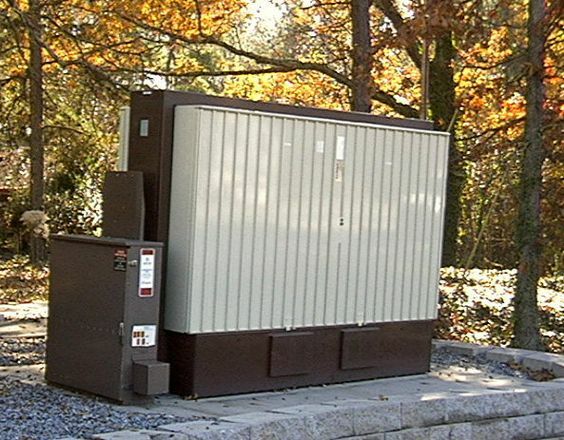 In a few cases, where an extended power outage occurred, such as during an ice storm, Southern Bell employees would take portable generators out to the SLCs and connect them up to keep them running. Sometimes these generators were stolen. While Step-by-Step offices were in use, the numbering plan in the exchange area was somewhat restricted. This was because Step-by-Step equipment switched called based on each digit as it was dialed. For this reason, the first two digits of a telephone number usually routed the call to the destination office. Calls to the outer metro offices were an exception to this rule since most of these calls were routed through tandem switching machines that used common control. Common control offices could route calls to any central office using any arbitrary 3-digit code. Once the remaining Step-by-Step offices had been removed from the Atlanta Exchange, suddenly the numbering plan could be more flexible. It no longer mattered if the various codes in a particular office had the same first 2 digits. And the numbering plan introduced for EAS in the 1950s and 60s was abandoned. That plan required all outer metro offices to have codes beginning with "4" and "9" and Atlanta numbers to begin with "2", "3", "5", "6", "7", and "8". This was partly so that Atlanta Step-by-Step offices could switch those calls to a tandem machine on the first digit. An example of this change was the assignment of the "381" code in Lilburn as the fourth code following "921", "923", and "925". Once this type of number assignment became commonplace, it became more difficult to mentally associate telephone numbers with locations. Microwave Communications, Inc. (MCI) had been building a network of microwave towers and trunk facilities between major cities since 1969. These initial facilities were offered to large business users, more or less competing with AT&T's leased private line circuits and WATS Lines. In 1980, MCI began to offer general Long Distance service to the general public. Since MCI's circuits were not tied into the local telephone company's equipment the same way that AT&T's circuit's were, you couldn't simply dial "1" or some simple access code to use them. The service required you to dial a local 7-digit telephone number in your city, wait for a tone, and enter your account code plus the number to be called. A Touch Tone dial was required. This was rather inconvenient, but the cost savings were substantial. At first, MCI only had a presence in a few cities and you could only call between those cities on their network. By the mid 1980s, other competing long distance companies, such as Sprint and Satellite Business Systems (SBS) had started up. They all used the same method of having you dial a local access number and enter your account number. At first, they all had limited service, only to cities where they had equipment. Then, eventually, they began to make use of AT&T facilities to provide access to the rest of the country. In 1982 following pressure by MCI and other competitors, The Bell System was split apart by federal mandate into AT&T and the Regional Bell Operating Companies (RBOCs) and the country was split into 160 Local Transport Areas (LATAs). Each RBOC was permitted to carry long distance traffic only within a LATA. Traffic between LATAs had to be handled by a long distance company and long distance companies were prohibited from providing local telephone service. LATAs have nothing to do with area codes. Some georgia C/Os are actually part of LATAs that belong to bordering states. For example, Ringgold is part of the Chattanooga LATA (472). To make the playing ground more equal and to keep from giving AT&T an advantage, the local telephone company had to allow the customer to choose his own long distance carrier. The customer had to be able to place calls on their chosen carrier by simply dialing "1". Additional carriers had to be accessible using a short code "10XXX". This was referred to as "Equal Access". This divestiture was finally completed by the end of 1983. At that time, BellSouth Corporation was formed as the Regional Bell Operating Company (RBOC) serving the southeast. 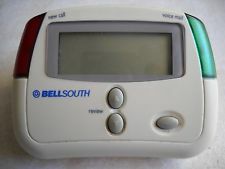 BellSouth was at that time the parent company of Southern Bell and South Central Bell which continued to operate independently and doing business under their own names. Southern Bell territory included Georgia, North and South Carolina, Florida, and Alabama. Around 1982, Satellite Business Systems (SBS), offered long distance service carried entirely over satellites. The service was cheaper than much of the competition but every call, even calls to neighboring states went 22,000 miles into outer space to be relayed off of the satellite and had an annoying delay. During this period, long distance competition was well underway, but the original equal access plan mandated in 1982 was not yet ready. As a temporary measure, the local telephone companies assigned an unused prefix "950" to gain access to these long distance carriers. So accessing a carrier, such as Sprint, required a 7-digit number like "950-1033". Over the next decade, many small long distance carriers appeared. Most of these had not built their own intercity trunk cable or microwave facilities and were simply resellers of circuits belonging to other companies, such as AT&T. A company basically leased a series of WATS Lines from AT&T and used them to route long distance calls from their customers. A number of these companies went bankrupt, leaving large unpaid bills for the circuits they had used. In 1976, AT&T had introduced a new signaling system on its long distance network known as CCIS (common channel interoffice signaling). This system had been under development since the 1960s to replace the Multi-Frequency signaling system. Unlike Multi-Frequency signaling, which uses tones to send information from one office to the next, CCIS sends call setup information over separate channels, known as "D Channels". This is an outgrowth of computer modem technology. No signaling is sent over the voice path, rendering Blueboxes useless. The system also permits more information to be sent from machine to machine on each call and administrative information to be sent across the network. 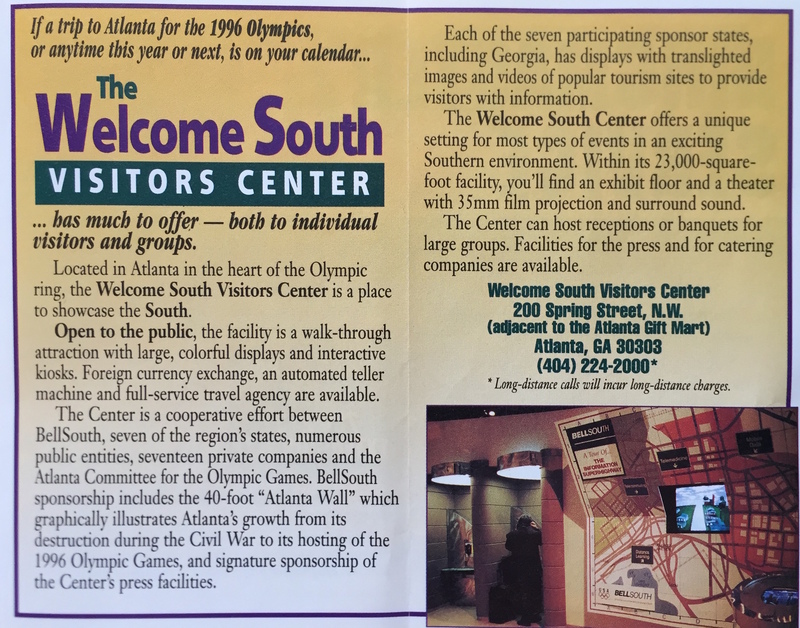 Around 1985, Southern Bell began to deploy CCIS in the Atlanta area. When placing a call between two offices that had it, your call went through almost instantly. When Multi-Frequency signaling was used, it took 2-3 seconds after dialing for your call to go through. Most people probably didn't notice the difference. But included in this change was the transmission of calling party information to the destination central office. This made it possible to introduce new services, which made use of this information. Another interesting characteristic of CCIS is that it does not tie up any trunk facilities if the distant line cannot be reached. If you dial a number and the line is busy, a message is returned via CCIS back to your central office and the busy signal is returned locally. The first Atlanta central offices to be set up for CCIS signaling were the No. 1A ESS and No. 5 ESS offices. The DMS-100 machines were not converted until a year or two later. CCIS was later renamed SS6 (Signaling System Number 6) and became an international standard. Between 1979 and 1980, the international standards organization CCITT approved the specifications for the next version, SS7. SS7 was introduced into the U.S. around 1988. By 1996, nearly all interoffice signaling in the United States was SS7. Another type of service started to become very popular in the early 1980s. DID (Direct Inward Dialing) service permits you to dial directly to individual departments or people within an organization. This is similar to Centrex service. The price for the service had become very reasonable and many businesses decided to take advantage of it. The service requires the assignment of a block of telephone numbers to each company that uses it. The company can assign the numbers to any telephone on their PBX. Prior to the 1970s, all local and long distance calls were carried over analog trunk circuits. In the 1970s, digital T-Carrier trunks had begun to appear in the local network, but not to a significant amount in AT&T's long distance network. Then in the 1980s, long distance carriers began to install large quantities of fiber optic cable. In February 1983, AT&T began fully digital service using fiber optics from Washington, DC to New York City to interconnect its 4ESS toll switches. Soon, most AT&T customers could make toll calls that were digital from end to end. MCI followed AT&T by installing fiber about a year later in the Northeast, Then in 1987, Sprint's network was fully digital over fiber optics. Sprint had a big marketing campaign based on how quiet their all-fiber network was. As early as the 1960s, The Bell System had been working on digital switching systems and had introduced the first large scale digital switching system, the No. 4 ESS, for toll switching in 1976. But for some reason, they had still not introduced a machine suitable for use in a local central office. In 1979, Northern Telecom, the manufacturing arm of Bell Canada, had introduced a series of highly successful digital machines called DMS (Digital Matrix Switch), the first of these being the DMS-10. Due to the breakup of the Bell System, individual Bell Operating Companies were no longer obligated to buy all of their equipment from Western Electric. Due to the urgent need to replace the last of its Step-by-Step equipment, Southern Bell placed orders with Northern Telecom for a number of its DMS-100 switching machines. The first one began service in 1983 in McDonough. A number of DMS-100s were installed within the next several years. In addition to the machines installed as electro-mechanical replacements, a couple of DMS-100 machines were installed as expansion units in existing ESS offices. The Courtland Street office, for example, received a machine in late 1983. Western Electric was not far behind in its introduction of digital local switching with the No. 5 ESS. Bellsouth's first No. 5 ESS was delivered to the Buford office 1983 and began service on March 4, 1984. Over the next several years, both No. 5 ESS and DMS-100 machines began to appear in a number of offices in Atlanta and the surrounding areas. The Forest Park office was not converted until February of 1986. The Ben Hill and Morrow offices were converted shortly after that. The last crossbar office in the city may have been the Ben Hill office. By 1988, all of the electro-mechanical equipment was gone. The No. 5 ESS was also used to provide Integrated Services Digital Network (ISDN) voice and data service. This service was inaugurated on April 12, 1988 out of the Dunwoody central office with six initial customers. Some time in the early 1980s, Southern Bell and other Bell companies introduced a series of services called "Touch Star". These services made use of the additional capabilities provided by the SS7 signaling system. This was practical only after all electromechanical switching equipment had been removed from service. The name TouchStar comes from the idea that you use the asterisk or "Star" key on the Touch Tone keypad to access these services. Touchstar services rely on the ability of the central office to identify the calling party. This was possible only after the introduction of SS7 signaling. The first Touchstar services were very limited in capability. This was partly technical and partly political. The technical limitations were based on the incomplete conversion of the local area to SS7 signaling. Some central offices still were not equipped for it. When you received a call from one of these offices, the calling party could not be identified and the Touchstar services would not work. And at this point, the service did not work at all for incoming long distance calls. These services were also a hot political topic. Many people were concerned about the loss of privacy that would result if their telephone numbers were made available. For this reason, none of the initial Touchstar service would give you the telephone number of the calling party. You could request them to be called back by using Call Return and you could report them to the telephone company if they were harrasing you by using Call Tracing. But you were not allowed to know their number. Using the first version of Call Return, you pressed *69 and the caller was rung back immediately. Several years later, the political issues were worked out. This permitted the introduction of Caller ID service, which provided you with a numerical display unit to see the calling party's number. In the 1980s, FAX machines became very popular. They had been around for many years. But the price for the equipment had come down considerably. Most businesses now had machines and FAX became a very important means of conducting business. The FAX machine also lead to the demise of TWX and international Telex service. Prior to the 1980s, the number "911" was not standardized in North America. There were some places that had it, but most didn't. In Atlanta you had to call Police, Fire, and ambulance using separate 7-digit telephone numbers. Each agency had its own separate dispatchers. You were also responsible for calling the correct county or city agency, depending on where the emergency was. If you called the wrong county, there was no easy way for the dispatcher at that county to transfer you to the correct one. This added delays. While you were generally expected to keep a list of emergency telephone numbers next to your telephone, many people simply called the Operator and said "Operator, get me the Police!". This may have worked OK in a small town, but in a big city it presented a number of problems since operators didn't necessarily know which county to connect you to. And operators did not have a "hot line" to the police. They had to dial the number just as you did. So in the 1980s, Atlanta central offices were gradually converted to handle 911 service. This was announced to customers on a county-by-county basis as it became available. 911 Service required the establishment of a new call center, manned 24 hours by dispatchers. Creating this was more of a government activity than a telephone company activity. The telephone company had to enable the 911 code in the central offices and have the calls routed to the correct location. This was no easy feat. One of the issues was that many central offices served customers in multiple county or city jurisdictions. So routing had to be determined by the individual customer's address. Something the central office switch had never had to worry about before. Even after the service was well established, customers would sometimes be incorrectly set up and their 911 calls would go to the wrong place. The first 911 system did not provide calling party identification to the emergency dispatcher or it may have provided only the calling telephone number. Later, the service was enhanced so that the calling party's name and address were obtained from telephone company records and displayed on a screen for the dispatcher. In addition to FAX machines, the 1980s was a period of huge growth in the paging business. Many companys began to offer competing pocket paging devices. These had been around since around 1974. The first pagers had no display screen and simply beeped. They were also called "beepers". A few years after their introduction, pagers enabled the caller to leave a callback number, which would be displayed on the screen. In the 1980s, pagers became less expensive and became more popular. Each pager required a telephone number. This added to the demand of telephone numbers that ultimately led to the exhaustion of numbers in the 404 area code. RingMaster is an interesting adaptation of an old technology to a new purpose. 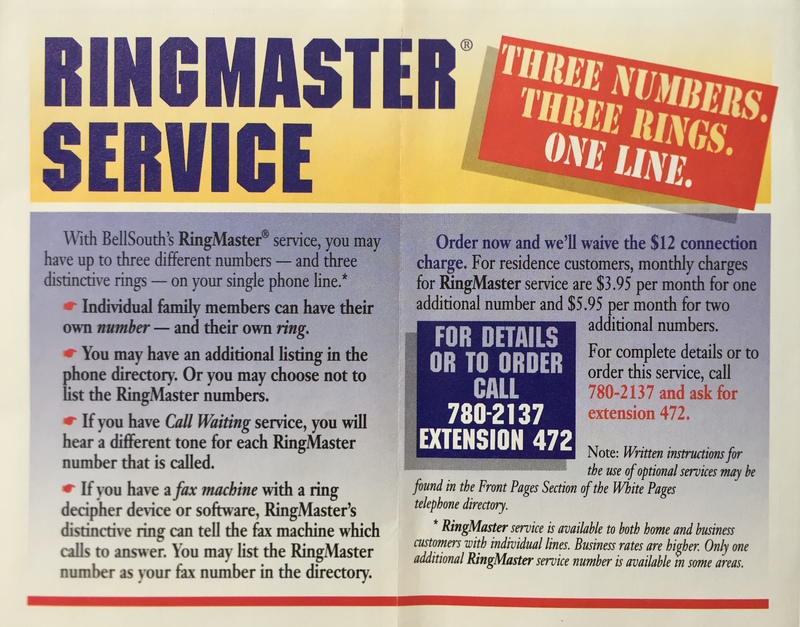 In fact, it could be said that the idea behind RingMaster service originated in 1879 on the very first telephone exchange. RingMaster assigns multiple telephone numbers to the same physical telephone line and gives each number a distinctive ringing pattern. This is exactly what was done with Party Lines from the beginning of telephone service. The only difference is that with a party line, different people in different households are connected to the single line and listen for the different ringing patterns. So it is as if you are ordering a party line with old fashioned coded ringing and having the whole line to yourself. The service concept is so simple, it is amazing that they didn't offer this much earlier. It would have been easy to do even with Step-by-Step and Crossbar systems. MemoryCall was the telephone company's voicemail service. Prior to the introduction of MemoryCall, voice mail systems had been in use for some time in businesses. The hardware that provides it is basically a computer. Telephone companies were able to offer this service to residential and small businesses by simply installing this equipment in the central offices. Dial It! Service has to be one of the most obnoxious additions to telephone service, second only to Telemarketing. When introduced in the 1980s, you began to see the special 976 local numbers and 1-900 numbers in advertising. This service is the opposite of 800 Toll-Free service, charging you a sometimes large fee for placing a call. The charge collected by the telephone company is passed on to the owner of the Dial It Service number. Dial It Service invited scam artists to milk the public for money and prayed on the parents of children who unknowingly ran up enormous bills. The telephone company refused to take any responsibility in this misuse of telephone service other than eventually offering to block access to these numbers. But sometimes that was too late, after the customer was required to pay thousands of dollars for these calls. In 1991, final policies on Caller ID technology were approved by the FCC, although interstate delivery of calling party number identification was not approved until 1994. The first version of the service only identified the calling number but not the name. The later version of the service added the caller's name. Many incoming calls could still not be identified and showed up as "Out of Area" or "Anonymous", depending you the type of display unit you had. This was still particularly a problem with incoming long distance calls. Once Caller ID became available, the Call Return service was changed so that it gave you the calling party's telephone number and offered you the option of ringing them back. A few years later, Caller ID service was enhanced further with the addition of the calling party information on Call Waiting calls. This service was marketed as "Call Waiting Deluxe". In 1993, Pactel Cellular and Bellsouth Mobility were offering cellular service in Atlanta. The first cell phones were not easily portable. Most were mounted in cars. The original cellular systems were entirely analog. But cell sites were built quickly. There were many reception "holes" throughout the city. Many people objected to the construction of these towers. This lead to an attempt to camouflage them as something else. On North Druid Hills Road, a cell tower was disguised as a pine tree. It even appeared to fool the squirrels. Another one looked like a giant street lamp, and another looked like a church steeple. The FCC alottment of radio spectrum allowed for two cellular carriers per operating area. These were designated "A" and "B". The "B" carrier was usually the same company that owned the local telephone network and was known as the "wire line carrier". The "A" carrier was the "non-wire line carrier" and did not own wired telephone facilities in the area where it served as the "A" cellular carrier. But that company could own wired telephone facilities elsewhere. PacTel, for example provided cellular service as the "A" carrier in Atlanta. This was a division of Pacific Bell Telephone, a large Regional Bell Operating Company (RBOC) in California. The per-minute rates for early cellular service was very expensive. It was not unusual for people to receive $300 telephone bills. And roaming to other cities was even more expensive. Not all carriers had agreements to permit roaming. If you drove your car into a city outside of your own carrier's coverage area, you could usually get service on the same system "A" or "B" but not usually on the other even though that carrier might have a stronger signal. In the mid 90s, digital cellular technology emerged and the FCC approved a new frequency band for these services. A new name PCS (Personal Communications Service) was given to the new service. But most people called it "cellular". The first PCS carrier in Atlanta was AT&T in around 1996, followed by Nextel, then Powertel around 1997. U.S. Sprint entered the Atlanta market around 1999. Each of the PCS carriers used different, incompatible technologies. A telephone that worked on one system would not work on another. You would have to buy a new phone. AT&T adopted the TDMA system, Powertel used the GSM system, and Sprint used the CDMA system. All were PCS technologies using the same radio band allocated by the FCC. Due to many mergers and acquisitions, the cellular companies have changed. PacTel became Airtouch, then Verizon. Bellsouth Mobility became Cingular. And Powertel became VoiceStream. Starting in the 1990s, the growth in the use of FAX machines, DID Service, and pagers had begun to use up a large number of telephone numbers throughout North America. And this was before cellular telephones became commonplace. This resulted in a series of area code splits. In 1992, Area Code 404 was running out of numbers. The Georgia Public Service Commission authorized the first split. All of Area Code 404 outside of the Atlanta Metro area was to change to 706 while Atlanta remained 404. Some of the border communities, such as Cartersville, Gainesville, and Covington which were not part of the local calling area, fought the change, wanting to stay in 404. In the end, several more counties were added to the 404 area. The fury was rather pointless anyway since those that stayed in 404 would end up getting changed again in a few more years. Shortly after the area code split, the local calling area was once again expanded. The expansion included all of what had remained in Area Code 404 plus the Alabama towns of Fruithurst and Ranburne in Area Code 205. Once again, in 1995, Area Code 404 was running out of telephone numbers, requiring another split. This time, the plan was to leave the Atlanta Exchange in area 404 and move all of the outer metro offices to the new area code 770. The boundaries of the Atlanta Exchange had hardly changed at all since 1880, when the Kimball House switchboard was the only office. For example, the original Atlanta Telephonic Exchange in 1881 shows lines extending out to Oglethorpe on the northeast side. At that time, the area was very sparsely populated and a long stretch of road extended between Oglethorpe and anything else to the north. This area would have been served by rural lines extending out of the downtown office until about 1915. Then it would have been served out of the Hemlock office. In 1931, the Buckhead office took over this area and Oglethorpe remained inside the Atlanta Exchange. A few blocks to the north of Oglethorpe is the boundary, the other side belonging to the Chamblee Exchange. By the 1990s, there was no discernable boundary. Other boundaries around the city were also established before growth caused the areas to merge. Most people outside of the telephone company were unaware of the significance of these old boundaries and expected things to go according to easily recognizable major roadways and landmarks. The most noted was Interstate 285, which formed a ring around the city at almost the right spot. But central office and exchange boundaries crossed over I-285 and other major roadways. To split the area code at I-285 would have required changes such as putting part of the Chamblee office in 404 and part of it in 770 since it's area crossed the Interstate. This would have meant changing not only the area code, but the prefix too for people in these areas. It still might not have been a bad idea. But it wasn't done that way. Since the local calling area now had two area codes, the dialing plan had to change. At this point, the dialing plan permitted 7 digit dialing within your own area code and required 10 digits when dialing between local area codes. At the time of the 770 split, the towns of Concord and Zebulon which had just recently been moved to the 706 area were moved to 770. But these towns remained long distance. In addition to the area split, the towns of Braselton and Gay in Area Code 706 were added to the local calling area. Their area code remained 706. 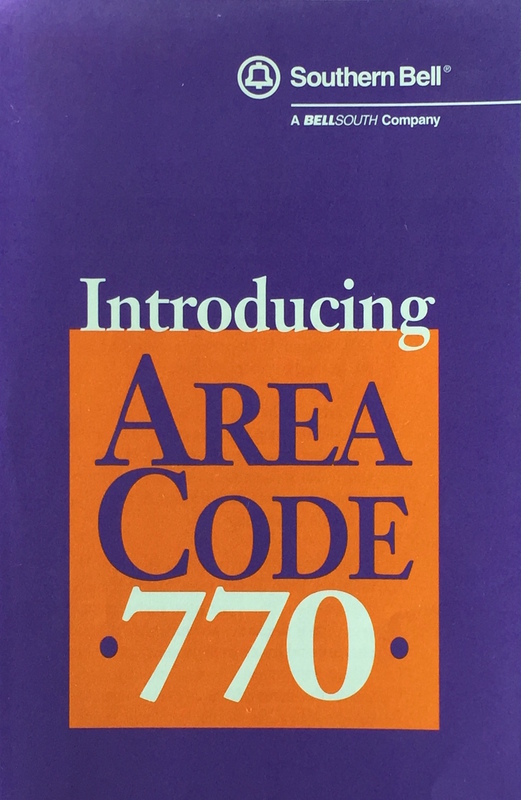 In 1996, the town of Jasper in Area Code 706 was added to the local calling area. Then in 1997, the Big Canoe Resort and the town of Fairmount in 706 plus Concord and Zebulon in 770 became local. The Olympic logo started to appear on pay phones around this time. In 1997, it became apparent that the 770 split was insufficient to provide enough numbers for the local area. Instead of creating another split, this time, the Public Service Commission approved an overlay. 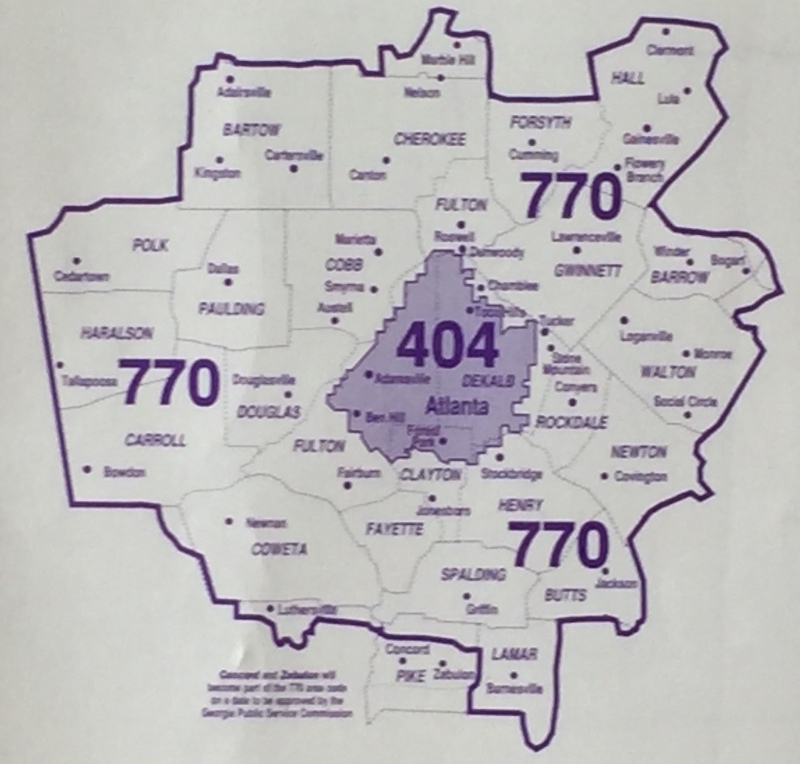 The new area code 678 was overlayed on top of the 404 and 770 areas. To make this work, customers were required to dial 10 digits for all local calls effective January 1, 1998.